Mixing desired flavour pulp/sauce in pasteurized full cream milk and pouring it over -40 degrees food graded stainless steel pan within 45 seconds so that the texture/milk gets frozen and crystallizes, to get rolled out & served. What are the ingredients used to make Pan Ice Cream? A set of natural and nutritious ingredients such as milk, cream, sugar and complementary toppings. How is it different from regular ice creams? 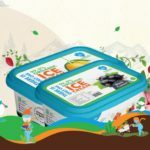 Since it is an altered ice cream, there is zero chance for adulterants and manufactured hues; it gives the best taste of drain mixes and common organic fruit pulps. We have vast rundown of flavours extending from common natural fruit products, Italian flavours and regulars. Is Iceberg, the introducer of Pan Technology in India?